Max Wilson is pictured with some of his donations at St. Mark’s Church in New Britain. “Max” Bruce Maxwell Wilson is a senior at Suffield High School. He was introduced to the New Britain area by his grandmother, who developed Alzheimer’s while Max was very young. One of her neighbors, Kelly Nauss, often came over to help with yardwork at his grandmother’s home. Max was inspired by learning of Kelly Nauss’s personal struggles while watching him give to others in need at his Friday night dinners in St. Mark’s Church, where Max frequently volunteers. Kelly would serve as a mentor and a support for his future fundraisers. Max had begun to develop insight into the world outside of his home. He has a passion for raising awareness to the needs of others. 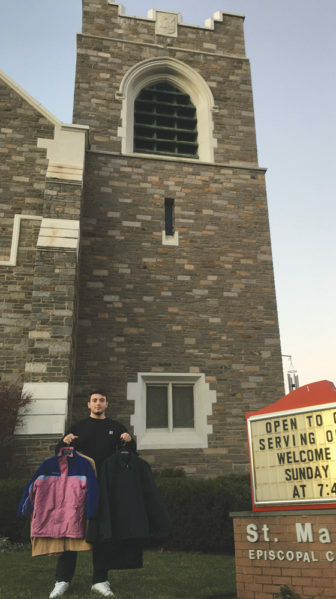 He organized the “Button-Up New Britain” coat drive in November 2017 where he collected over 250 coats from donations and distributed them to the New Britain community in St. Mark’s Church. Using monetary donations to the coat drive, he led another initiative in January 2018, the “New Year, New Pillow” drive in which he purchased brand new pillows and obtained a donation of socks to donate to the Friendship Center and Prudence Crandall Center of New Britain. Max wishes people knew about the general struggle of the people around them. Life is much bigger than the individual problems that the average person focuses on. Max is asking for donations for his current project collecting school supplies for children in need, allowing the children the dignity and opportunity to focus on learning. Please contact him at brucemaxwilson@gmail.com.